The minor league seasons are reaching into their final two weeks. A couple of teams have a shot at making the playoffs with a strong end to their season. While development is the most important thing in the minor leagues, learning how to win and being in that environment can be a positive thing for the players' development too. It should be a fun couple of weeks following the Twins and their minor league system. Keep reading to find out more on the night in the Twins minor league system on Friday. As always, please feel free to discuss and ask questions. There were no transactions in the Twins minor leagues before their Friday games. However, after their game, Cedar Rapids announced that RHP Calvin Faucher has been placed on the disabled list with right elbow tendinitis. But, the Midwest League named its postseason All-Star team. Both Royce Lewis and Alex Kirilloff were named to that team. Lewis was named the league’s top prospect. Things were going well for Red Wings starter Zack Littell through the first five innings. He had yet to give up a run, but he got just two outs in the sixth inning and was charged with four runs (three earned). Nick Anderson gave up just one hit over the final 2 1/3 innings. He struck out three batters. The Red Wings offense wasn’t able to do much. Robbie Grossman, in his second rehab game, went 2-for-3 with a walk. Taylor Motter had a walk and his ninth double. Jeremy Hazelbaker hit his second triple. As per the plan, Byron Buxton is playing every other game as he returns to the Red Wings lineup. He played on Tuesday and Thursday, and he didn’t play on Wednesday and again on Friday night. In another battle of #1 overall picks, Royce Lewis came up big again. The top pick in 2016 was Mickey Moniak by the Phillies. He hit his fifth home run In this game, his 104th FSL game. Lewis the top pick in the 2017 draft went 2-3 with a walk and his fifth High A home run in just 32 games (14th in 107 total games in 2018). Both young players are likely to be future MLB stars, and they are both kids who played with and against each other in southern California. For the Miracle, the big story was the performance of lefty Bryan Sammons. After pitching very well in Cedar Rapids, Sammons has had some struggles since joining the Miracle. In four appearances (three starts), he had given up 18 runs (16 ER) in 12 2/3 innings. On this night, he was fantastic. He gave up just one run on three hits and a walk over six innings. He struck out six. In those 12 2/3 innings before this start, Sammons had walked 11 batters. That is uncharacteristic for him. In his 85 1/3 innings in Cedar Rapids, he had just 22 walks (2.3 BB/9). Jovani Moran came on and picked up his fourth save in his time with the Miracle. He worked the final three innings and gave up just one run on two hits. The run came on Moniak’s home run late in the game. Moran hit a batter and struck out three. Also of note, Alex Kirilloff had played in 14 games in August and had at least one hit in each game. However, on this night, he went 0-for-2. He has now hit in 27 of his last 29 games. A four-run sixth inning broke things open for the Kernels in this game. Trey Cabbage hit a three-run homer for the game’s biggest hit. Cabbage went 2-for-4 with four RBIs, as he added another run with an RBI single in the eighth inning. His homer was his eighth of the season. Gabriel Maciel went 3-for-4 with his first triple. Trevor Larnach added his first professional triple. Jordan Balazovic has had some struggles of late, but he was good on this night. The Canadian right-hander gave up one run on two hits. He walked two and hit two, but he also struck out five. Derek Molina got the sixth inning. He walked two, but he also struck out three batters. Jose Martinez racked up his seventh save by throwing three scoreless innings to end the game. He gave up one hit, walked one and struck out six. Andrew Cabezas continues to pitch well. In this game, he provided the Twins with a quality start. In six innings, he gave up one run on four hits. He struck out just three, but he didn’t walk anyone. Tanner Howell came out and pitched the final two innings. He was charged with an unearned run on one hit and an intentional walk. He struck out three. Colton Burns continued to show power. In his 24th game, he had two hits including his sixth home run of the E-Twins season. It was his fourth in his past eight games played. DaShawn Keirsey went 2-for-4 with his seventh double. Yunior Severino also notched his seventh double. This game started last Saturday, but after three innings, there was no score and the game was tied 0-0. Donny Breek had thrown three scoreless innings for the Twins. Then the rains came and the game was suspended. When it was resumed on Friday, Frandy Torres was on the mound. He struck out five batters over three scoreless, hitless innings. He walked one. Casey Crosby continued his rehab and threw two scoreless innings despite giving up a hit, walking one and hitting one). Steven Cruz earned his second save by striking out two in a perfect ninth. Tyler Webb led the offense. He went 2-for-4 with both RBI. He also stole his seventh and eighth bases for the GCL Twins. Shane Carrier continued his rehab. He entered the game as a pinch runner and scored. Later he had a single, stole a base and came around to score the second run. I guess you could say that Donny Breek started both games that the GCL Twins played on Friday. Of course, he started “Game 1” six days earlier and made the regularly scheduled start in this game. On this day, he gave up four runs (three earned) on six hits and two walks over 3 1/3 innings. He struck out five. Denny Bentley came on and got two outs. He walked one and struck out one. The Twins had just two hits through the four innings. Tyler Webb had a double. The game will be resumed at a later date. Twins Daily Hitter of the Day: Trey Cabbage, Cedar Rapids Kernels (2-4, HR(8), 4 RBI). Here’s a look at how the Twins Daily Midseason Top 20 Twins Prospects performed. #3 - Brusdar Graterol (Ft. Myers) - Did not pitch. #20 - Luis Arraez (Chattanooga) - No Game Scheduled. *Since Wander Javier is out, I’d add #21 to the list. Please feel free to ask any questions about Friday’s games, or ask any questions you may have. Good to see Bryan Sammons toss a solid game after some rough outings. The FSL South race is fun to watch right now.The Miracle hanging on to first place by the thinnest of margins over those pesky Charlotte Stone Crabs.I think they can pull this off with like 15 games remaining.Obviously, the everyday lineup is solid.The key will be the starting pitching down the stretch. Barnes, Graterol and Jax appear to be giving them consistent starts.Need Sammons, Cutura and Beeker to also pitch well the next couple weeks. Ryan Mason and Jovani Moran have been good out of the bullpen. I completely understand the development of a young, or very young, milb player. And I have never been one to stand on a soapbox and just scream out "damn the torpedoes! This future star did it, so why can't this guy?!" And I believe the FO, scouts, coaches and managers are a hell of a lot smarter about development and promotions than I will ever be! But really, unleashing just missing something about defense, approach and production, shouldn't Lewis and Khiriloff be in the AGO and begin next season in AA? Tyler Webb has a pool and a pond.Pond would be good for you. I've been following Balazovic carefully for some reason, at least, as close as you can by reading through his game logs. I don't feel like he's been struggling much at all lately; seems like when he's given up runs it has been at the end of his outings, when he gets pulled, or like tonight--An occasional "small ball" run aided by an untimely walk or HBP. Put another way, I'd call his struggles "productive." Seems like textbook development with him--learning how to pitch while building strength and stamina. On the topic of Lewis and Kirilloff--it is pretty easy to cherry pick 20 year-olds in the majors, because there are so few. In this post, Seth compared the two #1 picks, Lewis and Montiak. Lewis, a year behind, is clearly the better player right now. Kirilloff, drafted in the same year--but also a year behind, developmentally, due to the injury--is also clearly much better. Count your blessings. Both these guys will be at AA next year and on standby for a call-up. Yes indeed, it certainly makes you wonder. As noted in previous posts, the development of each player is different, but it appears that both Lewis and Kirilloff are special cases and "rushing" them to the majors may not be such a bad idea. I'm all for patience and caution when the situations warrant it, but it would also be refreshing to the Twins promote guys like these two who have shown unusual aptitude. The most impressive thing about Lewis is how much he increased his walk rate at High A.
I don't know what the AGO is, but I have no doubt both will start 2019 in AA. The Twins have never been slow in promoting top bats. Like I wrote a week or two ago, Lewis is well ahead of both Correa and Lindor in their timeline. He's ahead of where Mauer was at this time. They haven't been and won't be slow with Lewis... Or Kirilloff. 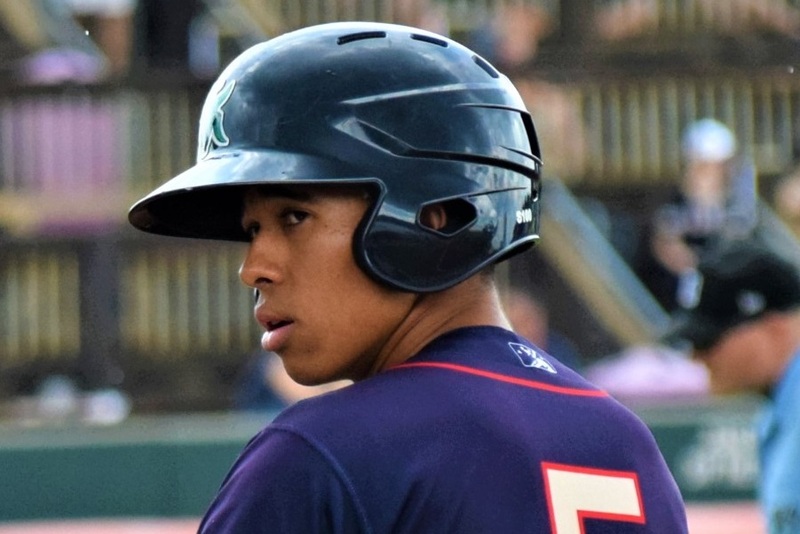 Lewis is young for his draft class, so he could be a 19 year old in the big leagues. But again, they're going to do what they feel is best for them. I've tweeted a few times that I wanted Lewis to be promoted from Cedar Rapids to Ft. Myers 6 weeks earlier... However, it was during those six weeks that Lewis added the doubles and home runs, and now he's carried that up to Ft. Myers with him. So, there certainly is a plan. Had Lewis been promoted to the Miracle when I thought he should be, maybe he's not taken the huge step forward that he has. That's fair, and he's flown up my rankings even in his "textbook development." But he came up and dominated right away, and then the numbers didn't match that for a few starts. That's not at all unusual, especially for a 20-year-old. He's doing just fine. Fort Myers and the Kernels are in first by a hair, ETon has a comfortable lead late in the season.The GCL Twins and Red Sox are tied, well, kind of because the Red Sox are up 4-0 in the 7th inning of their suspended game.And they play each other in 5 of their 8 remaining games, including the suspended game from yesterday.I guess their playoff run has begun! The AA and AAA clubs haven't had great seasons, but the lower five are all in the playoff hunt.That includes the DSL Twins who at 45-20 are tied for first with a week to play. I think Kiriloff should have been moved to AA awhile ago. He isn't being challenged by pitchers there and I think the Twins should have sent him to a level where he'd struggle a bit. Lewis did struggle a bit at A+ and isn't anymore so they should've done the same for him. Yes, Rochester has been offensively challenged all year.The Wings are probably thinking "Oh well, Kirilloff and Lewis will be here within the next year or so to help out". Then watch the Twins jump Alex and Royce right from AA to the bigs!